Canoeing and kayaking is such a versatile activity that can be enjoyed on all types of waterways the world over from the River Severn to the Turkish Riviera to wild coastline of Alaska and it requires very little equipment and preparation – just a thirst for exploration and the great outdoors. The waters of the British Isles are ideal for canoeing – there are thousands of miles to explore as well as a wonderful variety from simple touring on placid water, through to challenging white water descents as well as some spectacular and remote coastal scenery on its surrounding waters. Upland rivers are often suitable for white water kayaking, whereas lowland rivers are more suited to gentle touring and exploration. The UK’s several thousand miles worth of canals offer safe touring waters. The sea attracts those wanting to ride the rolling waves on surfing bays, those who want to tour around offshore islands or around the rocky outcrops of cliff coastlines. Camping is ideal accommodation for downstream paddlers as it suits the spontaneous spirit of canoeing and its backwater countryside routes. Travellers can simply camp down at the nearest site for the night when they get paddle weary. For those who want the luxury of a proper bed after their full day’s exercise then apart from the more remote parts of the UK there are usually numerous B&Bs, youth hostels and pubs along the way. For peace of mind it is nevertheless worth researching accommodation opportunities in advance. The scenic and unspoilt 100 miles of the River Wye provide an ideal location for an independent canoe touring holiday. The Wye springs from deep within the Welsh mountains and flows through such beautiful locations as Hay-on-Wye, Hereford, Ross-on-Wye, Monmouth and Tintern before joining the Severn Estuary. The lower Wye Valley, with its steep wooded cliffs and rich wildlife and birdlife, is renowned as a particularly good paddling area. There are numerous campsites along the way for bedding down, as well as many good riverside pubs for a restorative ale or two. There are many travel companies that organise canoeing and kayaking touring across Europe. These are usually group activities involving between 5 and 20 people with at least one guide leading the way down river. They are typically 7 day adventures, although there are options for shorter and longer trips, and involve a few hours of canoeing a day along with a varied itinerary of sightseeing. The beautiful Vézère and Dordogne rivers in south-west France are particularly popular with canoeists and touring groups. Boaters paddling through this region can explore the medieval villages and tranquil countryside and taste the famed French cuisine. There are many organisations offering group activities along these rivers, which are ideal for those new to canoeing. These tours include accommodation, which is usually based a variety of campsites on route. 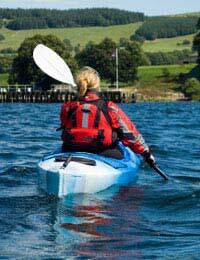 Sea Kayaking is a generally more challenging pursuit because of the tidal waters and beginners are advised to either complete an introductory course before heading out or seek the supervision of an experienced guide. There are ample opportunities to take part in sea kayaking across the world from the remote Scottish Highlands to the mountains and caves of Phang Nga Bay in Thailand to the marine life treasures of Mexico’s Sea of Cortez. An ideal introduction to sea kayaking abroad can be found with a week long trip through the secluded bays, beaches and coves of the Turkey’s Riviera, the Turquoise Coast. No kayaking experience is necessary but a good level of fitness is essential to enjoy the experience. Organised adventures through this region take kayakers on a tour of the ancient Lycian, Roman and Byzantine ruins and include plenty of stops for swimming and refreshments.More experienced kayakers can follow different tours, with itineraries more suited to their abilities. Canoeing has since the dawn of the civilised world provided a means of exploration and despite the invention of more advanced water craft, its popularity has not diminished and continues to be an excellent way to see the natural world.